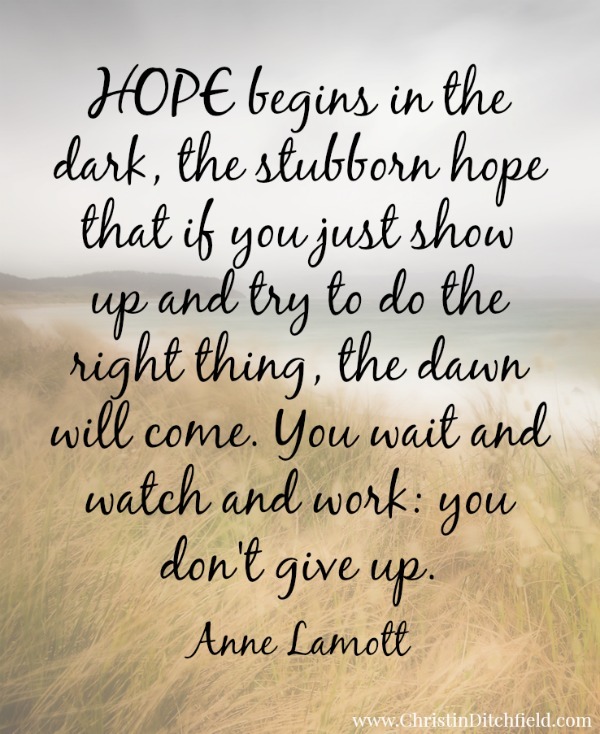 Do you know what it means to hope? If you hope for something, it’s because you not only want it to happen, you believe and expect it will. You not only want to receive it, you believe you will. You’re just waiting for it to happen. 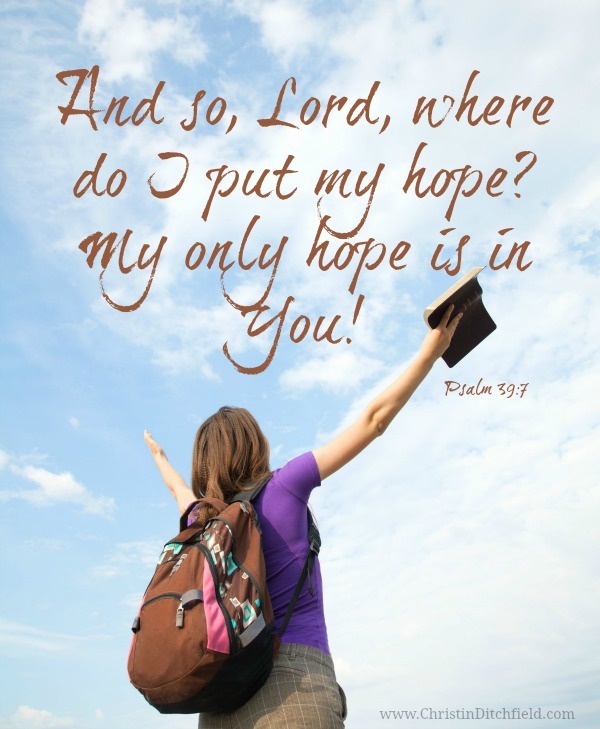 But the hope described in the Bible is a living hope, a confident hope, an assured hope, a blessed hope, an eternal hope. Our hope is in “the God of Hope” (Rom 15:13) who keeps His promises. We don’t always understand His plan… why He allows some things and not others, why He intervenes sometimes and not others, how He chooses to move in the hearts and lives of those around us. When life gets hard, we don’t have to put our heads down and just push through it… or curl up in the fetal position and hide. We can take a deep breath, relax, and let Him lead. Lift our heads, and look around us, as we take one step at at time. And hold tight to His hand. If you’re participating in our online summer Bible study, Virtual VBS for GrownUp Girls: Holding on to Hope… When Life Is Hard, this week we’re reading 1 Peter 1:3-2:12, 1 Peter 4:12-19, and 1 Peter 5:8-11. In some cases it will be simpler to summarize the concept, and in others just to use the words and phrases as they appear. The easy response at this point would be to think, “Wow, this is really good stuff. Hmm… Amen! The Church needs to hear this! Yes!” And if you’re feeling really inspired, to post a few verses as your Facebook status. 1. Look over that list of things God has given you / promised you (YOU, not just “us”) and let it sink in. Really think about it — and then respond in a SPECIFIC way. A specific way to you, that is. You could… spend some time in praise and worship during your daily quiet time, saying the words or singing them. Or writing them as a prayer or love letter or poem. Go for a walk in nature, and spend the time talking to Him. Or make something for Him. Or do something you know He loves — on behalf of someone He loves. However you do it, find a way, take a moment, to genuinely express your gratitude. 2. Prayerfully look over the “To Do” and “NOT To Do” list, and ask God to show you specifically one thing that you personally can do “To Do” or “NOT Do” something on the list. In other words, something in your own life you need to work on, something that will help you stand firm or press on or rejoice or not grow weary or discouraged or hold on to hope! There may be a lot of things you see, but ask Him to help you start with one. A lot of women, for example, have committed to spending time in the Word before they go online — before they check email and social media, and get inundated with all the negativity and the drama and the need and the distraction, which can be so overwhelming. But it could be something very different for you. Maybe there’s some other habit or activity you need to look at, an attitude or a relationship you need to reconsider…. And if you haven’t already, click to download our free Memory Verse Printables. This week’s verse is 1 Timothy 4:10. It’s on our VBS Pinterest board. As you’ve been reading this week’s passages, anything jump out at you? Anything you’ve been thinking about that you’d like to share?